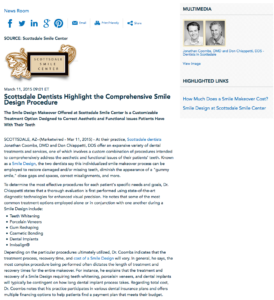 The Smile Design makeover offered at Scottsdale Smile Center is a customizable treatment option designed to correct aesthetic and functional issues patients have with their teeth. Scottsdale, AZ — At their practice, Scottsdale dentists Jonathan Coombs, DMD and Don Chiappetti, DDS offer an expansive variety of dental treatments and services, one of which involves a custom combination of procedures intended to comprehensively address the aesthetic and functional issues of their patients’ teeth. Known as a Smile Design, the two dentists say this individualized smile makeover process can be employed to restore damaged and/or missing teeth, diminish the appearance of a “gummy smile”, close gaps and spaces, correct misalignments, and more. Depending on the particular procedures ultimately utilized, Dr. Coombs indicates that the treatment process, recovery time, and cost of a Smile Design will vary. In general, he says, the most complex procedure being performed often dictates the length of treatment and recovery times for the entire makeover. For instance, he explains that the treatment and recovery of a Smile Design requiring teeth whitening, porcelain veneers, and dental implants will typically be contingent on how long dental implant process takes. Regarding total cost, Dr. Coombs notes that his practice participates in various dental insurance plans and offers multiple financing options to help patients find a payment plan that meets their budget. Ultimately, Drs. Chiappetti and Coombs say their goal for Smile Design procedures is to help patients achieve smiles they are proud to show off, and the two dentists encourage anyone interested in enhancing both the appearance and function of their teeth to seek a qualified dental professional to ensure they receive an optimal level of care. Dr. Coombs obtained his dental degree from the University of Louisville and is one of only three percent of dentists to have earned “Fellowship” status with the Academy of General Dentistry by completing hundreds of continuing education hours. He also maintains active membership in the American Academy of Cosmetic Dentistry, the American Academy of Implant Dentistry, and several other esteemed dental associations, as well as multiple charity organizations. Dr. Chiappetti earned his Doctorate of Dental Surgery from the University of Southern California and has since been dedicated to continuing education across all aspects of dental care. He is an active member of such organizations as the Academy of General Dentistry and the American Dental Association, and he also volunteers his services and expertise to different charities in the Scottsdale-Phoenix area. Both Dr. Coombs and Dr. Chiappetti are available for interview upon request.